My sister-in-law, Tina, is an amazing person. She’s the middle girl in Old Goat Honey’s family and typical of the middle child, she’s easy-going but hardworking, innovative and willing to try new things, kind-hearted, peace-loving, and makes a great friend. She’s had some trials in her life but her perseverance always pulls her through with flying colors. She loves animals and her home in Australia has turned into a mini animal sanctuary for all the animals she’s rescued. I’m forever in awe of how artistic she is. She can draw, paint, sculpt… She made a mobile for No. 1 when he was born that was absolutely adorable. I always say she’s the family McGyver. Give her a sheet of plastic and an exacto knife and she’ll have a bunch of crowns made and all the children playing King Arthur’s Court in no time. Did I mention she cooks and bakes, too? She taught me how to make Maja Blanca. This is her recipe. Maja Blanca is a traditional Filipino dessert. It’s kindof like a coconut pudding studded with kernels of corn. It sounds strange to think of coconut and corn together, but believe me this dessert is sooo good, you’ll find yourself coming back for seconds and thirds. I think Maja Blanca is traditionally topped with latik which is basically coconut milk curds. To make latik, you bring some coconut milk to a simmer and keep simmering till the oil separates from the milk solids which eventually start to fry in the oil and and turn into little brown curds. It’s a lot of work. My shredded coconut topping is way easier. From the 4 cans of coconut milk, you’ll be able to get 5 cups for the 1st Mixture, but you won’t have enough left over to make 2 cups for the 2nd Mixture. Never fear. What you’re going to do is pour the last of the coconut milk into your 2-cup measure and then add enough of the liquid drained from the whole kernel corn to make 2 cups. Same thing with the evaporated milk. You won’t have enough in the can to make 2 cups but it’s not worth opening a whole ‘nother can when you’re just a little bit short, so pour the evaporated milk into your measuring cup and then add enough corn liquid drained from the whole kernel corn to make the 2 cups that you’ll need for the 1st Mixture. If you run out of corn liquid, go ahead and use water. It’ll be fine. Grease a rectangular pyrex glass baking dish or metal baking pan with butter or margarine. Mix all the ingredients of the 1st Mixture together in a large pot. In a bowl, mix together the ingredients of the 2nd Mixture using a wire whisk until smooth. Bring 1st Mixture to a boil over moderate heat, stirring occasionally. When boiling, pour the 2nd Mixture into the pot, scraping it all in with a rubber spatula, and continue to cook, stirring constantly until thick. The mixture will thicken really fast so this step is best done by two people. One person to stir the pot while the other person pours the 2nd Mixture into it. Quickly pour maja into prepared baking pan. Melt butter in a frying pan. Add grated coconut and sugar and toast, stirring constantly until golden brown. Watch carefully because the coconut burns fast! Sprinkle toasted sweet coconut over maja blanca. NOTE: If you can’t get fresh grated coconut, you can substitute unsweetened dessicated coconut. If you can’t get unsweetened dessicated coconut, you can use sweetened dessicated coconut but cut the 1/2 cup sugar down to 2 tablespoons. This is a big recipe so it’s great for potlucks and family gatherings. It makes enough to fill a 9×13 rectagular baking dish with enough left over to fill an 8-inch round pie plate. If you have a dish bigger than 9×13, use it to make one giant dessert. Filipinos eat a lot of pork. They’re really good at cooking it, too. Lechon is one of the national dishes of the Philippines. It’s basically a whole roasted pig. The pig is skewered on a bamboo pole and slow roasted over hot coals while being continuously hand-turned like a giant rotisserie till the skin turns a crisp, reddish-brown and the meat becomes juicy and tender. Lechon Kawali is made from pork belly that’s boiled until tender, then dried overnight, and the next day, is deep fried in a kawali (Filipino wok) till the skin is puffed and crunchy. However, cooking lechon kawali can be a dangerous endeavor. The pork belly pops and can splatter hot oil (or make “talsik” as they say) quite violently and can cause some pretty serious burns if you’re not careful. Not to mention making a greasy mess. Few are the Filipino cooks who have escaped unscathed from a bout with a slab of frying pork belly. Enter Lechon sa Hurno (Oven Roasted Pork Belly). Lechon sa Hurno is prepared similarly to Lechon Kawali except instead of being fried, the pork belly is baked in the oven. No oil splatters, no greasy mess, and no visits to the urgent care clinic. Just some tender pieces of pork topped with a delicious crunchy skin. This recipe differs from traditional Lechon sa Hurno in that you don’t boil the pork first before roasting. My cousin, Ana, has a business in the Philippines selling crispy pork belly and she said she uses lemon grass and bay leaves for “aromatics.” Meanwhile, I’d heard of roasting pork belly with a salt crust, kind of like the way they do with prime rib or whole fish, and decided to try the salt crust method of roasting the pork belly with aromatics underneath it for flavoring. Success! The meat was so tender and tasty. And the skin was to die for! Nicely seasoned and so crisp, you could hear the crunch across the kitchen as you sliced it. The day before you plan to roast your pork belly, wash it in cold water and dry it very well with paper towels. Then put it on a platter, skin side up, and place the pork, uncovered, in the fridge to dry overnight. The next day, take a long sheet of foil, fold it in half so you have a double thickness, and press it into your roasting pan. Lay a bed of chopped onions, lemon grass, and garlic on the foil, then place the oregano, thyme and bay leaves on top. These are your aromatics. If you’re not sure how to work with lemon grass, you can read about it here. Place the pork belly, skin side up, directly on top of the aromatics in the pan. Pull up the foil to enclose the bottom and sides of the pork belly, pinching the corners to fit the foil around the meat. Leave the top open to expose the skin. Carefully pour water against the foil along one side of the pork belly so it runs underneath the meat and mixes with the aromatics. This helps keep the aromatics from burning. If any water gets on the skin, dry it quickly with a paper towel. Pour the salt on top of the skin and pat it smooth to make a salt crust. Bake at 350ºF for 1½ hours. Remove from oven and raise oven temperature to 425ºF. Pull foil open to expose the sides of the pork. Using a pair of tongs, carefully lift off and discard salt crust. Usually, the salt crust lifts off in one piece. If it breaks like mine did, don’t worry about it. Just throw away the broken piece and carefully remove what’s left. After discarding the salt crust, pick up the pork belly with the tongs, hold it over your sink, and brush off any excess salt that may have spilled onto the skin. Place a wire rack over the pan and place the pork belly on the rack. Return pork to oven and bake an additional 30 minutes more. Turn off oven, turn on broiler to low, and broil for about 15-20 minutes or until skin is completely puffed up and golden brown all over. Watch carefully that it doesn’t burn! Slice into 3/4-inch strips. Then cut the strips crosswise into 1-inch pieces and serve. Living in the United States, we don’t always have easy access to Filipino food. I guess it depends on where in the U.S. you live. Unfortunately, where I live, if you want Filipino food, you need to make it yourself. There have been times when I’ve really been craving some native food from back home. This recipe was born from one of those cravings. Filipino bibingka galapong is a native cake made of rice flour that’s cooked in a clay pot lined with banana leaves. As strange as it sounds, the sweet little cakes are dotted with pieces of quesong puti (carabao milk cheese) and wedges of itlog na maalat (salted duck eggs). Growing up, the best bibingkahan to get hot, fresh-made bibingka was a place called Ferino’s. It was started in 1938 by a man and his wife who made their bibingkas on three clay pots set on a bench. From there, the business grew till they eventually had shops all over town. Anyway, I was craving the taste of Ferino’s bibingka one day. Since I don’t have a clay pot or banana leaves, and since we can’t get quesong puti or itlog na maalat where we live, I came up with this recipe which I called “Americanized Bibingka” because I baked it in a pyrex glass baking dish in the oven, and I substituted American ingredients for the native Filipino ingredients I couldn’t get – cream cheese for the quesong puti and dried shredded coconut for the itlog na maalat. It’s not Ferino’s, but it’s a really good substitute. This recipe makes a big pyrex dish so it’s perfect for parties or get-togethers. Don’t expect it to look anything like traditional native Filipino bibingka galapong. Just follow the recipe and you’ll get a good taste of what bibingka is like, albeit without the look. Everybody loves it, including all our American friends. In a bowl, mix together the flour, eggs, sugar and water. Pour batter into a greased 9” x 13” pyrex glass baking dish. In a small saucepan, melt and stir together the butter and cream cheese. The cream cheese mixture will be separated and lumpy. It looks weird, but don’t worry. This is normal. Pour cream cheese mixture as evenly as you can over the cake batter. Don’t worry about trying to make it perfectly even. You can’t. Remove cake from oven and top with shredded coconut (as much as you want). Return cake to the oven and broil till the coconut flakes turn golden brown. My Dad’s family hails from a place called Bay, Laguna in the Philippines. Bay (pronounced “Bah-eh” by the locals) is one of the oldest towns in the province of Laguna. Legend has it that the Datu or Tribal Chief of the area had three beautiful daughters. When the Spanish came to convert the natives to Catholicism, the Datu’s three daughters were baptized and renamed Maria Basilisa, Maria Angela and Maria Elena. The first letters of Basilisa, Angela and Elena were put together to form the name “Bae” which over time changed to “Bay.” The district of Santo Domingo in Bay was actually named after my great-grandfather, Domingo Ordoveza, who was a wealthy landowner in the area. I remember going to Bay as a little girl with my grandparents. We went every year during the town fiesta. There would be a huge party on the plantation with lots of people, tons of food, games, prizes, and fun. We stayed at the family homestead which I remember as a big, white house surrounded by lanzones trees. Lanzones is a small, yellow fruit native to the Philippines. I remember watching the boys climb the trees to pick the fruit for us to eat. One of the things I also remember eating is Buko Pie. The province of Laguna with all its coconut trees is famous for its buko pie. Buko is the Filipino word for “young coconut.” As a coconut matures, the meat becomes thicker, firmer and whiter; but young coconut meat is thin, soft and almost opaque in color. That’s the coconut we use to make buko pie. The coconut shell is cut in half and the buko is scraped out with a shredding tool that produces thin strips or strings of the meat. It’s absolutely delicious. Where I live in North America, I can’t get fresh buko (or fresh coconuts for that matter) so I have to buy frozen buko from the Asian grocery stores. It’s not as good as fresh, of course, but it works fine when you’re craving a slice of nostalgia in pie form. Combine flour, sugar and salt in a bowl. Using a pastry blender or two knives, cut in butter and shortening until the mixture resembles coarse crumbs. Pinch off a small clump of dough and squeeze it in your hand. If it does not hold together, sprinkle the dough with 1 tablespoon of ice water and blend with a fork. Keep adding ice water, a tablespoon at a time, until mixture just holds together when squeezed in your hand. Divide dough into 2 balls, one slightly bigger than the other, and flatten each ball into a disk. Wrap the disks in plastic wrap and refrigerate for at least an hour or up to 2 days. In a small saucepan, stir cornstarch into buko juice until completely dissolved. Stir in evaporated milk, sugar, vanilla and buko. Cook over medium heat, stirring constantly until thickened. Sprinkle flour on work surface and roll out the larger of the two disks into a 12-inch circle. When rolling, work from the center to the outer edges, spinning the dough occasionally to get an even round shape. Transfer the dough to a 9-inch pie plate, pressing into the bottom and up the sides. Trim off any excess dough. Place bottom crust in refrigerator while you work on second disk of dough. Roll out second disk on lightly floured work surface, spinning occasionally to get an even circle large enough to cover the pie. Take bottom crust from the refrigerator and pour filling into it spreading evenly. Place top crust over pie. Roll the edge of the top crust just underneath the edge of the bottom crust and flute the edges together all around the pie. Make an egg wash by beating 1 egg and 1 tablespoon cold water together. Brush egg wash all over top crust. Prick holes on the top crust with a fork to allow steam to escape the pie while baking. You could also cut 6 or 8 vent holes with a sharp paring knife, or cut out decorative designs with a pie crust cutter. Bake pie in oven for 35-40 minutes or until crust is golden brown. Cool on a wire rack before slicing. NOTE: If you have a food processor, use it to make the pie crust. It makes it so much easier and quicker. Besides, the less you handle the dough, the more tender and flaky your crust will turn out. Just follow the directions as listed, but instead of using a pastry blender or a fork, pulse the ingredients together in the food processor. Hamburger sandwiches are not native to the Philippines. That being said, hamburger joints abound everywhere and we ate burgers all the time growing up. But when it came to making burgers at home, unlike American burgers which are usually plain meat patties simply seasoned with salt and pepper, our cook would add all kinds of stuff to our burgers and boy were they good! Give this recipe a try and you’ll see what I mean. In a bowl, combine beef, pork, onion, bread crumbs, milk, egg, soy sauce, worcestershire sauce, salt, and pepper. Divide meat mixture into four balls and flatten into patties. Grill or fry until burgers reach desired doneness. Serve on toasted hamburger buns, with condiments and toppings on the side for people to build their own burgers. NOTE: If you want, you can make your burger patties with a pound of pure beef and leave out the ground pork. Our cook always used a mixture of half beef and half pork, but that was probably because beef was more expensive in the Philippines. Mangoes are indigenous to the Philippines. They grow quite a few different varieties all over the country. Filipinos love to eat them ripe and sweet, or green and sour. Philippine mangoes, in my opinion, are the best in the world. My favorite is the variety they call Carabao Mangoes. Their thin, smooth skins are easy to peel and hide a golden orb of juicy sweetness that’s unrivaled by any other country’s. South American mangoes, though good, are very fibrous. In contrast, Philippine mangoes have very little fiber. You could cut one open and eat the flesh with a spoon. We had two huge mango trees in our garden when I was growing up. I have very fond memories of sitting under the shade of the trees on lazy afternoons, reading a book or drawing. When harvest time came, we would get baskets and baskets full of bright yellow fruit from the overloaded branches. Way more fruit than we could ever eat. Our cook would make mango desserts, mango jam, and “burong mangga” (sweet pickled mangoes). We also gave away lots to friends and neighbors. 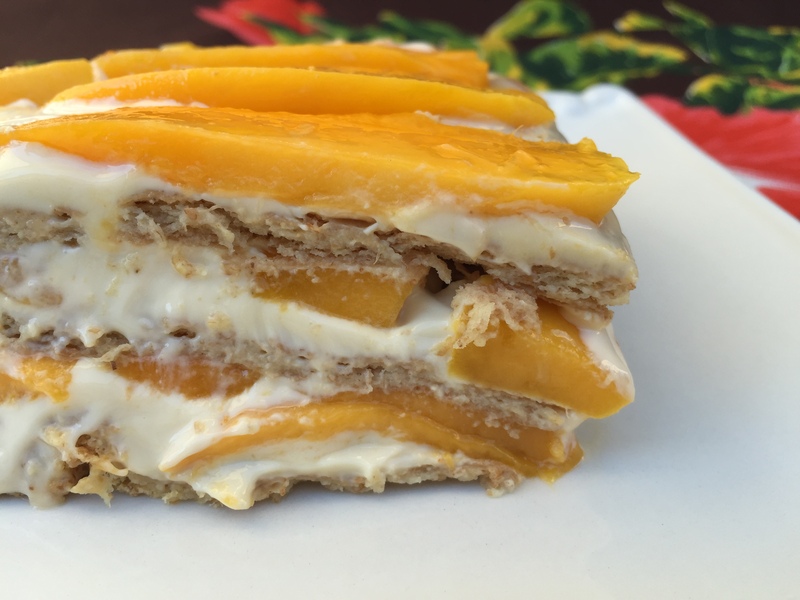 Mango Float is a very popular dessert in the Philippines. How this dessert got its name, I have no idea. To me, the name Mango Float conjures up images of a milkshake-type drink. Nothing at all like what this dessert is truly like. It’s rich and creamy and utterly delicious. You’ll find yourself wanting a second and third helping, it’s so good. And because it’s so easy to make, you’ll find yourself wanting to make it again and again. Whisk the Nestlé cream, 1 can condensed milk, vanilla, and salt together in a large bowl until well combined. Taste the cream mixture. If you want it sweeter, open the second can of condensed milk and add more, a tablespoon at a time, until the cream is sweetened to your liking. Arrange graham crackers in a single layer at the bottom of a 9×13″ pyrex glass baking dish. Cut and trim the crackers with a knife as needed to fit the baking dish. Spread 1/3 of the cream mixture over the graham crackers. 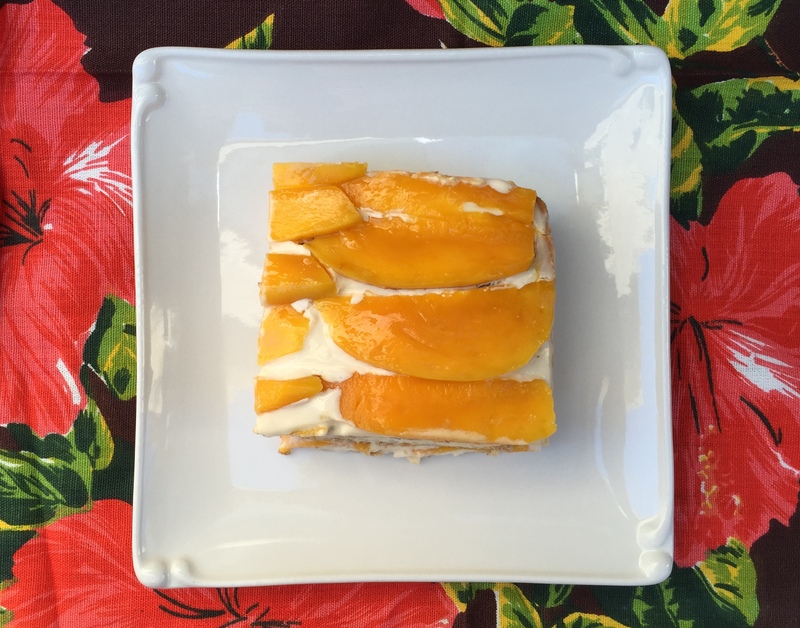 Top with a layer of sliced mangoes. Repeat layering two more times with graham crackers, then cream, and ending with mango slices. Chill in refrigerator for at least 4 hours, preferably overnight. NOTE: If you want thicker layers of cream between the graham crackers, add 1 can of Nestlé cream and ½ can of condensed milk to the cream mixture, then taste for sweetness and increase condensed milk by the tablespoon, if desired. No need to increase the vanilla and salt. My aunt, Tita Tinggay, was a wonderful cook who turned out delicious dishes for her family and friends. At one point, she even owned a restaurant in the Philippines where they served delectable Filipino food. I learned to make Toyo-Bam from her. How the dish got its name, I have no idea. Sadly, I never thought to ask Tita Tinggay. She’s passed away now or I would find out for you guys. There’s probably an interesting story behind it. I know that “toyo” means soy sauce in Filipino. Maybe the “bam” is just a descriptive adjective sort of like Emeril’s “Bam!” Who knows? Certainly the dish is delicious. The pork comes out falling-apart tender and the sauce is wonderful served over hot, white rice. Place the pork in a large stockpot. You can use bone-in or boneless pork, whichever you prefer. I usually buy bone-in. Add the soy sauce, water, brown sugar and chopped onions to the pot. Bring mixture to a boil; then lower the heat, cover, and simmer pork in sauce, turning occasionally until the meat is falling-apart tender. This can take anywhere from 2 to 4 hours or more, depending on how large your piece of pork is. Remove the cooked pork from the liquid and transfer to a serving platter with a lip. Dissolve the cornstarch in 2 tsp. water and slowly pour into sauce in pot, stirring constantly. Continue to cook the sauce until thickened. Pour the thickened sauce over the pork in the serving platter. Pull pork apart into chunks or slice it into neat slices if you prefer. If using bone-in pork, remove the bone and discard it. This dish is best served with hot, cooked white rice to pour the sauce over. When I was growing up in the Philippines, there was a bakeshop called Cookie Monster Bake Shop. They were famous for their delicious chocolate cake. The moist and tender cake wasn’t overly sweet, but it was the perfect base for the yema-like filling inside it and the rich chocolate frosting that covered it. My Mom tried to imitate their cake and came up with this recipe which tastes almost exactly like Cookie Monster’s. Mom would fill it with her coffee-scented mocha filling, and frost it with her silky chocolate icing. Our family called this Cookie Monster Chocolate Cake, but I honestly think my Mom’s version was better than the bake shop’s. I hope you don’t mind the odd format. Out of nostalgia, I decided to type out the recipe the same way my Mom had it written in her old, stain-spattered recipe notebook. Read it all the way to the end before starting so you can gather all your ingredients together. 1. Grease bottom and sides of two 9×13 rectangular baking pans. Line bottoms with parchment or waxed paper. 4. Pour over dry ingredients and mix well. 6. Blend thoroughly and pour into prepared pans. 7. Bake at 350°F for 35 minutes or until toothpick inserted in center comes out clean. 8. Turn cakes out onto wire racks to cool. Carefully peel off parchment paper. 8. When cakes are completely cool, fill with Mom’s Mocha Filling and frost with Mom’s Chocolate Icing. 3. Cook until thickened, stirring constantly to keep it from burning. This burns fast so watch carefully! 4. Keep cooking till mixture begins to bubble; then let boil for 3-5 minutes, all the while stirring slowly and continuously with the wire whisk. 5. Remove from fire and allow to cool completely before using. Press a piece of plastic wrap against the top of the filling, or stir it constantly while it’s cooling to prevent a skin from forming on the top. 2. Cook over medium heat, stirring constantly. 4. When chocolate mixture just begins to boil, pour one-third of it into the bowl with the beaten egg yolks and mix well. This tempers the yolks which keeps them from turning into scrambled eggs. 5. Pour yolk mixture back into saucepan and combine with the rest of the chocolate mixture. 7. Keep cooking over medium heat, stirring constantly, until mixture comes back to a boil. 8. Reduce heat to low and continue simmering, stirring till mixture reaches spreading consistency. 9. Cool completely before frosting cake. Press a piece of plastic wrap against the top of the frosting, or stir it constantly while it’s cooling to prevent a skin from forming on the top. 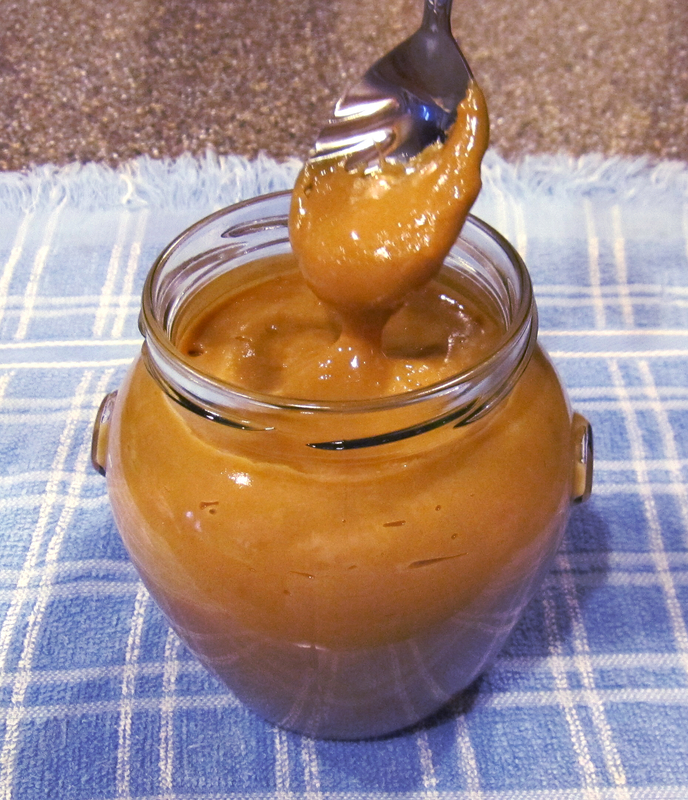 Dulce de Leche is a South American caramel confection. It’s made by cooking sweetened condensed milk until the sugar is caramelized and the milk is thickened and brownish in color. I remember my Mom boiling an unopened can of condensed milk for what seemed like hours on the stove. Of course we all grew up hearing the horror stories and dire warnings of how you should be careful because the can could explode, but none of that ever seemed to matter. What was most important was getting a taste of that sweet, thick, and sticky treat. I remember how awfully hard it was to wait for it to be ready, and even harder to wait for it to cool! But you had to let it cool before you could open the can or the dulce would spurt out and could burn you. We would eat it by the teaspoonful, carefully eking it out and eating it ever so slowly to make it last as long as possible because Mom would never let us have more than 2 little spoonfuls of it in one day. There are many different ways to make your own dulce de leche at home. You could do like my Mom always did and boil an unopened can of condensed milk on the stove for 2 or 3 hours. You could bake an unopened can in a water bath in the oven; or cook a can in a pressure cooker; or cook it in a slow cooker; or open a can, empty the milk into a pot and cook the milk over the stove, stirring till your arm falls off (don’t ask me how I know). Why, I’ve heard you could even make it in a microwave! My favorite method is super easy and doesn’t involve any risk of explosion or having your arm fall off. Give it a try and you’ll see what I mean. 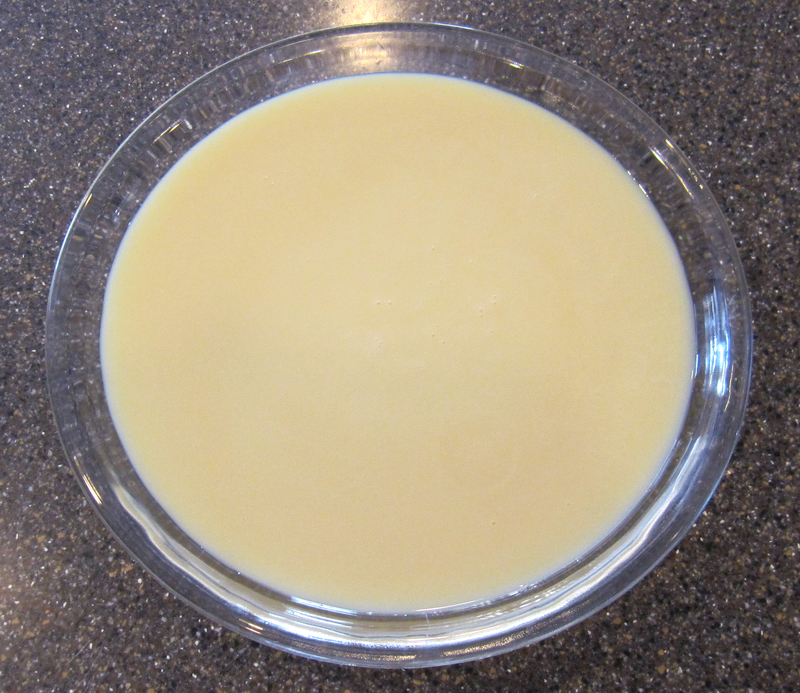 Empty 1 can of sweetened condensed milk into a glass pie plate. 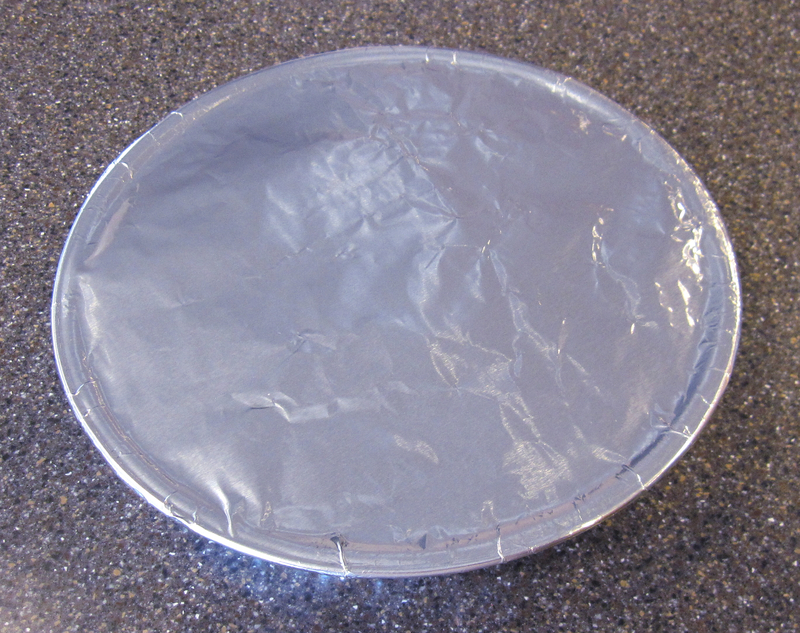 Cover pie plate tightly with foil. Make a water bath by placing a pan larger than the pie plate into the oven and filling it with enough water to go 3/4 up the side of the pie plate. Place pie plate in center of water bath and bake at 400ºF for 1½ hours or so, adding water as needed. The longer you cook it, the darker the caramel gets. Remove foil. The edges are usually more cooked than the center so take a wire whisk and whisk everything together until it’s well-combined and smooth. Pour into a clean jar and allow to cool before using. Store dulce de leche in the refrigerator for up to 3 weeks. 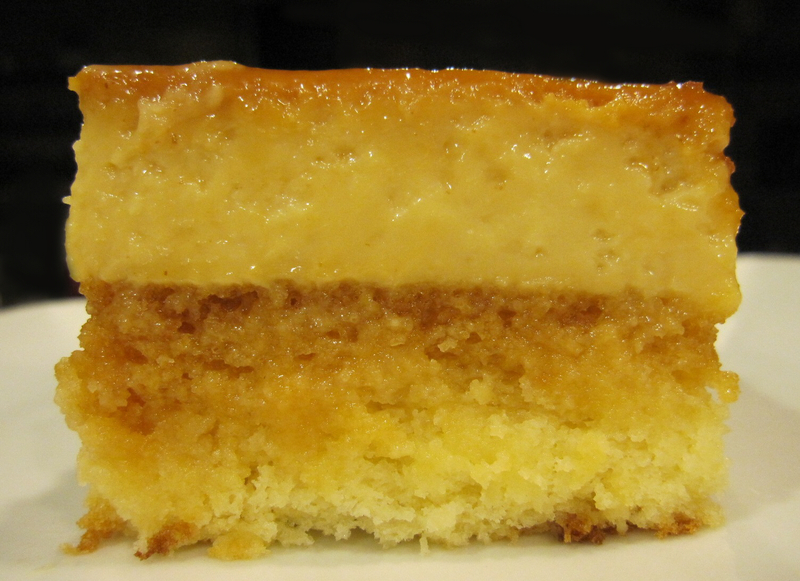 We ate Leche Flan Cake all the time when we were growing up in the Philippines. There was a canteen near my Lolo’s (grandpa’s) office that sold it for a few cents a slice. It was always such a treat to go visit my Lolo at work because he invariably would give us some money to run down to the canteen for a slice of Leche Flan Cake. Looking back, I think it was probably his way of getting rid of a bunch of noisy kids so he could work in peace for a while. LOL! Either way, I always thought the cake was the best part of visiting my Lolo at his work. Now, I make my own leche flan cake and hopefully, it’s created some fond memories for my own kids to look back on, too. Traditional leche flan cake has a thin layer of flan on top of a thick layer of cake, but my Old Goat would always ask if I could make the flan layer thicker (like I do with Chocoflan Cake). So I finally gave in and that’s why my leche flan cake doesn’t look anything like traditional Filipino leche flan cakes. I have to admit he was right though. I do like it better with a thicker layer of flan. The fam sure does, too. And so will you! 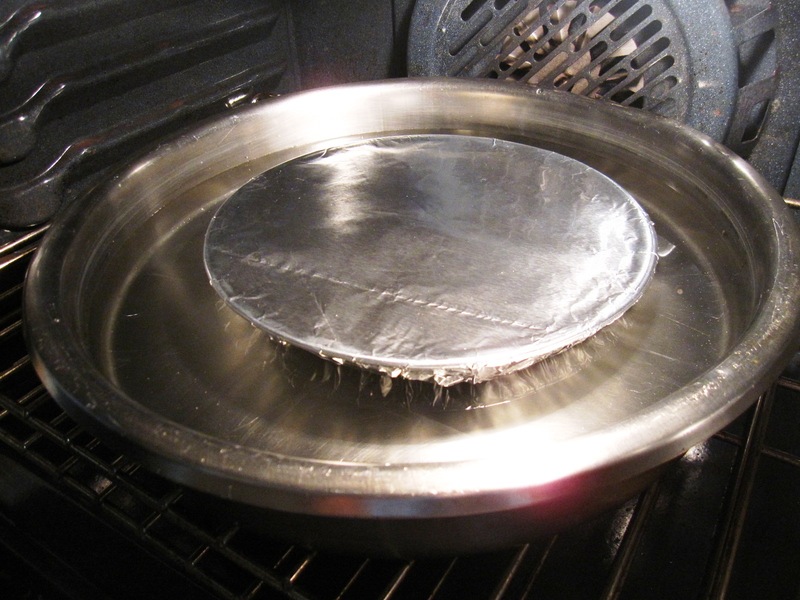 Pour sugar into 9×13-inch metal baking pan and set on stove over low heat. Cook sugar until it melts and begins to turn caramel colored. Tilt pan so caramel coats the bottom evenly. Use oven mitts! The pan will be hot! Set aside to cool. The caramel will harden and could crack as it cools. Don’t worry. This is normal. In a bowl whisk together the whole eggs, egg yolks, evaporated milk, condensed milk, sugar, and vanilla. 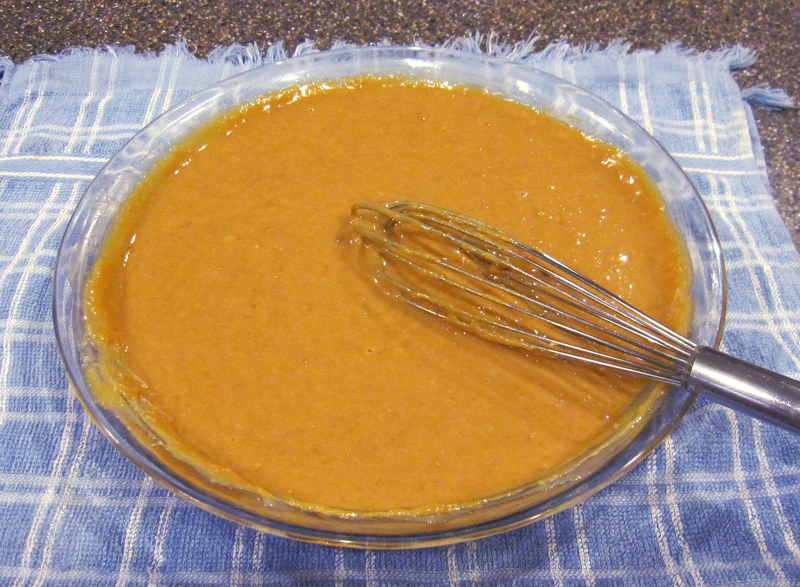 Pour the mixture over the cooled caramel in the baking pan. Sift together cake flour, sugar, baking powder, and salt in a large bowl. In a small bowl, whisk the milk, oil, egg yolks, and vanilla. Pour the milk mixture into the well of dry ingredients and whisk until combined. Set batter aside and make meringue. Beat egg whites and cream of tartar on high until frothy. Decrease speed to medium and gradually add the sugar. Continue beating on medium until eggs whites are glossy and form stiff peaks. Take a third of the meringue and carefully fold it into the cake batter to lighten it. Fold the rest of the meringue into the cake batter until no more white streaks remain. Pour batter slowly over the leche flan mixture in baking pan. Place baño maria (water bath) inside oven. You can use a large roasting pan for this. Fill with enough water to come at least halfway up sides of baking pan. Turn oven on and preheat to 325ºF. When oven is ready, carefully lower baking pan with batter into hot water in baño maria. Close oven door and bake for 1 hour and 15 minutes or until cake springs back when touched lightly in center. Remove cake from oven and allow to cool completely; then chill in refrigerator overnight. Run a knife along the sides of the cake to loosen it from the pan. Turn cake out onto serving platter with a rim to catch any caramel sauce that might drip.